FOR-A archiving workflows leverage Linear Tape-Open (LTO) technology. LTO is a magnetic tape technology developed by Seagate Technology, Hewlett-Packard, and IBM for data archiving. Since its introduction in first-generation LTO-1 tapes in 2000 (in a form factor called Ultrium, a half-inch magnetic tape in a single-reel cartridge), LTO has been used in archiving for more than 15 years. Although tapes are inherently a sequential medium, from the standpoint of recording and playback, they can now be used much like external disk drives, thanks to IBM's linear tape file system (LTFS), developed in 2010 for fifth-generation LTO-5 tapes. Reading and writing is possible without being aware that it is a tape. Except for special cases, such as controlling tapes with autoloaders, the basic software needed in various OSes is provided free of charge. Adopting the open-standard, open-source technology of LTFS has opened the door to a broad range of applications. As for speed and capacity, the release of LTO-7 near the end of 2015 enabled a maximum uncompressed transfer rate of 300 MB/sec for tapes that hold up to 6.0 TB. A hallmark of LTO tapes is that reading and writing is still possible as new generations are released. Specifications require new LTO drives to be able to read tapes from two generations ago and write to tapes of the previous generation. 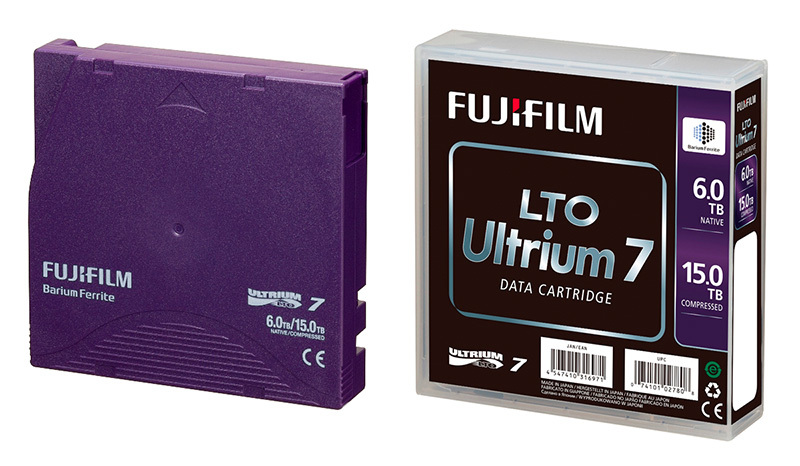 An LTO-7 drive released in 2015 can therefore read tapes as far back as LTO-5 and also write to LTO-6 tapes. Data archived on LTO-7 tape today can still be read by LTO-9 drives when they are released, and can be kept on these tapes until LTO-9 drives are no longer serviced. Considering that currently, as of August 2016, dealers still carry new replacement drives based on LTO-4 technology introduced in 2007 (before LTFS was introduced), this represents an archiving period with data readable for more than 15 years. LTO tapes themselves are also durable and withstand more than 20,000 loading/unloading cycles. Data is verified as it is written, by drive read heads positioned behind the write heads. In case of errors, the data is rewritten in a different position to guarantee writing reliability. Reliability is maintained by redundant recording for error correction, read retries after any temporary read error, and other features. LTO tapes have also been designed as an optimal medium for long-term storage. LTO tape maker Fujifilm has proven storage integrity of 30 years through accelerated evaluation. Users are assured that data on the tapes will remain intact under adequate storage conditions during the period of availability for LTO drives that can read them. LTO tape users include financial institutions and big data companies, where they are used for server backups and archival storage. Video backup and archiving solutions from FOR-A take advantage of the large capacity, long-term integrity, and superior reliability of LTO tapes.